Above: Maria and Vasil Dokovi, Vlado Petrov. In 2017, ATD Fourth World invited people around the world to document real-life “Stories of Change” arising from situations of injustice and exclusion caused by extreme poverty. These stories, from activists, community leaders, and others, show that when people work together, real change can happen. For more about the “Stories of Change” blog, click here. 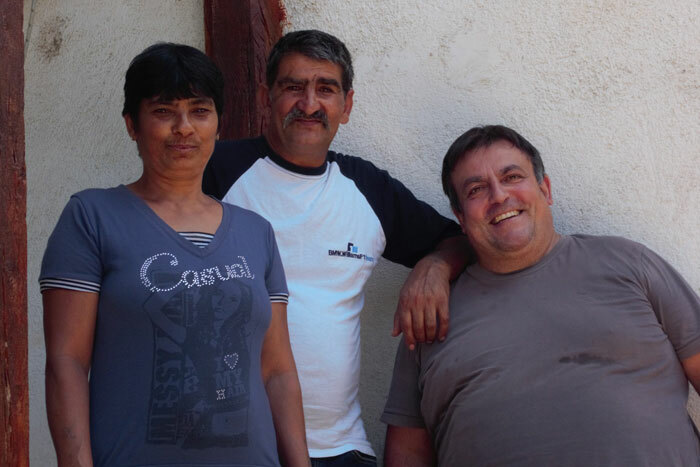 Maria and Vasil used to live in a deprived area close to a village, 100 km North of Sofia in Bulgaria. They shared what gave them the will and the strength to change their lives, and how they built a relationship of trust with a citizen, Vlado. “It all started with our granddaughter Dida. She was ill and needed to go to a hospital for sick children, because of her asthma. In order to bring her home, we were asked to have a place with good conditions that could welcome her. With five girls, one boy, and their families, the barrack where we were living at that time was too small for all of us. We were looking for different opportunities, but it’s difficult when you have no money. Dani, working for a foundation supporting sick children, helped us to find a small trailer that could be added to our place. It took a lot of time: almost one year to install the trailer so that Dida could come back. Last year, thanks to Dani, we met Vlado. Dani told us that Vlado would not cheat us. She told us that we could trust him and that is exactly what we did. We had the courage to do all of this because of Dida. For her, we also built a bathroom. Everyone in our family contributed. Nonetheless, we wanted to get out of the shanty-town we lived in. It was miserable. Vlado helped us. He gave us pigs and chickens. It was not easy to raise them, but after a while, we had small pigs. We sold some of them. We also sold the chickens. We still have two pigs and our son also has two. Now, our son wants to have his own small farm, so that he can do more than us! Then, Vlado gave his point of view: “It took time to build trust between us. At the beginning, the family called me “the Bulgarian” and never “Vlado”. This is because there is no trust between Roma and Bulgarian people. For me, it was important to come to see them, and to be with them when they needed me. We all need to be like this – on both sides. They did much more than what I could have expected. They had the will to do a lot. They just needed to believe it was possible, that they were capable of it. Maria explained: “This other family has nothing. We want her as well to feel happy as we are. For us, now, we feel more free than ever. What we dreamed became true”.